The Martian Chronicles is an excellent collection of loosely-tied short stories which together, make the history of man’s conquest of Mars. 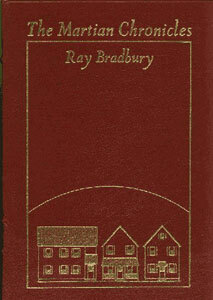 It is one of Bradbury’s finest books, and certainly the most popular one. The Martian Chronicles is one of those rare books showing mankind as alien invaders on another planet. Mars is perhaps the most common source, in early SF literature, for invasions into Earth - the most famous example being H.G. Wells' War of the Worlds. In Bradbury’s novel, we see how it can happen the other way around. As in Wells' work, here, too, the Martians are killed by Earth’s bacteria -- but rather than a case of victory in war, this is a sad disaster. The desease wiped out a beautiful, wise, and ancient civilization. Spender turned and went to sit at the fire, looking into it. Chicken pox, God, chicken pox, think of it! A race builds itself for a million years, refines itself, erects cities like those out there, does everything it can to give itself respect and beauty, and then it dies. Part of it dies slowly, in its own time, before our age, with dignity. But the rest! Does the rest of Mars die of a disease with a fine name or a terrifying name or a majestic name? No, in the name of all that’s holy, it has to be chicken pox, a child’s disease, a disease that doesn't even kill children on Earth! It’s not right and it’s not fair. It’s like saying the Greeks died of mumps, or thr proud Roman died on their beautiful hills of athlete’s foot! If only we'd given the Martians time to arrange their death robes, lie down, look fit, and think up some other excuse for dying. It can't be a dirty, silly thing like chicken pox. It doesn't fit the architecture; it doesn't fit this entire world! And it’s rather obvious that Bradbury considers it to be wrong. And yet, The Maritan Chronicles is not only a criticism. At times, it can only be described as a poetry in prose. You will probably also enjoy Simak’s City, reviewed here.